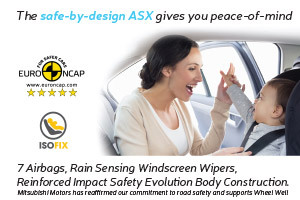 Not only was safety, especially child safety, clearly of utmost importance when designing and planning the ASX, Mitsubishi South Africa has taken this a step further by endorsing and partnering with Wheel Well, an NGO passionately committed to child road safety and highly emphasize rear facing baby and toddler seats. Together they have launched an initiative whereby used child seats may be dropped off at any Mitsubishi dealership for redistribution by Wheel Well. With high incidence of preventable child injury and death in South Africa, Mitsubishi offers via Wheel Well lifesaving information available to ensure customers are aware of the critical importance of child seats. Mitsubishi’s ASX sports an impressive 78% rating for child safety attributed to the ISOFIX mounting points fitted to the strongest part of the car’s chassis, ensuring the highest safety level for children in child seats, which every parent may appreciate. Lessening possible accident injury is achieved by 7 airbags, impact reinforcement body construction, ABS braking, Electronic Brake-force Distribution and Side Impact Protection Bars all resulting in a reassuring 5-star Euro NCAP crash safety rating. And while the ASX scores high on safety, it also ASX excels at the best of compact SUV features with its square front design, sturdiness and high ground clearance for driving on any road type. Driving the ASX test car for a week it impressed with its ease of use. Overtaking is a breeze with this powerful car and it performed great uphill despite a heavy load in the back. Some extra safety features are the convenient big side mirrors and when reversing the music is automatically paused for extra driver concentration. With its comfortable steering, electronic driver seat adjustment, rear view camera and foldaway side mirrors when locked the ASX is not just an ideal mom’s car, but will suit students, seniors and anyone who prioritize safety. Fuel consumption average 7.5 l/100 km and included in the deal is a 5 year/ 90 000km service plan.